Today is Thursday March 24 and we have some simple errands to do in the morning. 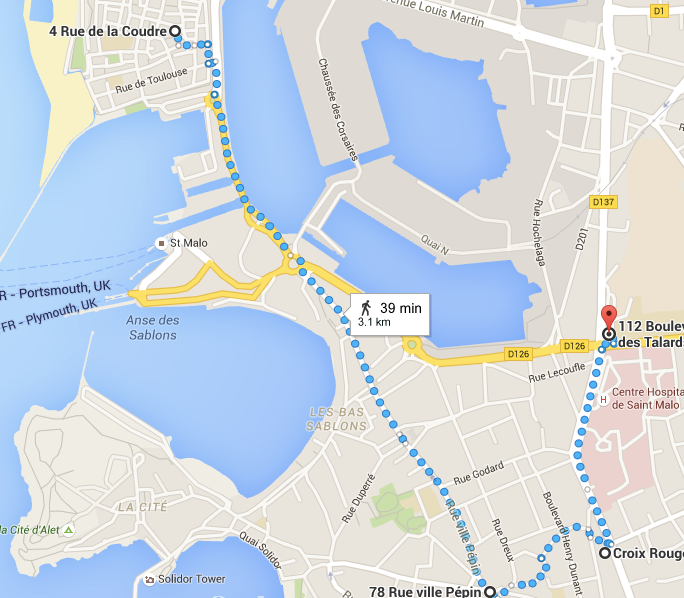 We will walk to Saint-Servan to shop at a chocolate shop (chocolatier) and then walk a little farther to the Red Cross (Croix Rouge) used clothing boutique. The walk started very nicely as we spotted some magpies (pies) as we crossed the bridge into Saint-Servan. We stopped at a really nice chocolate shop and purchased some chocolates for our friends for Easter. As always in this shop we received free samples of the chocolates. We also stopped at a yarn shop. Sandy was able to buy the cotton yarn she had been looking for in town. On with the crocheting. We then walked to the Red Cross shop. They were having a special sale and the shop was very crowded. We spent more time standing around trying to get around people than we spent looking at the sale items. From the Red Cross we walked past the hospital to the bus stop which would take us back to the Intra-Muros and our apartment. On the way back Phil stopped at his newspaper shop (Tabac Presse). On Thursday he gets the daily Ouest France newspaper and the weekly Pays Malouin. 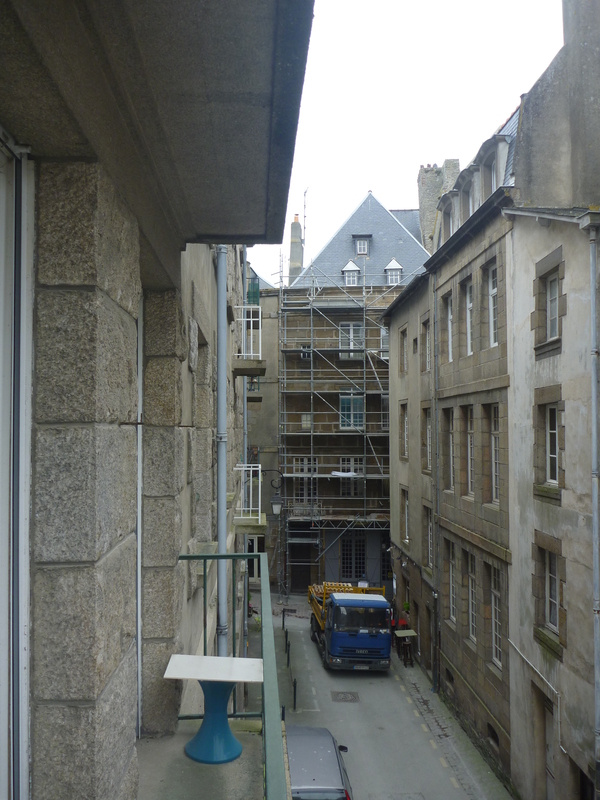 The Pays Malouin specializes in local Saint-Malo information. 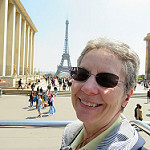 In the afternoon Phil called our friends in Paris to say hello. 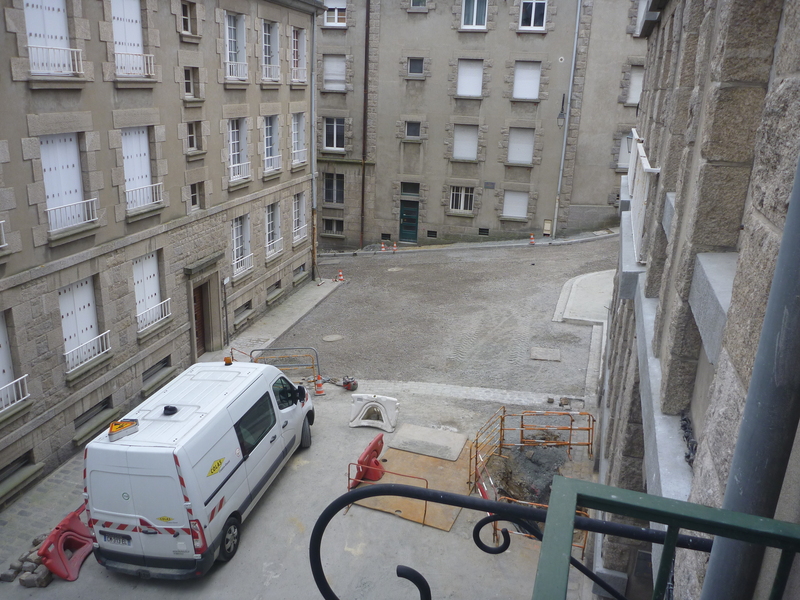 They are getting things in place so they can come to Saint-Malo in the next month or so. They have the apartment on the 4th floor of our building. Our apartment is on the 2nd floor. After the call, we started to hear some construction noise out on the street. The city maintenance workers were filling in holes from the water pipe replacements. That was on the south end of the street. On the north end of the street there is some building facade maintenance being done. So the street is a bit of a mess. Luckily we do not have a car. After dinner it started to rain and it is supposed to rain a bit tonight.